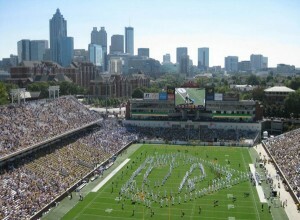 The Georgia Institute of Technology Marching Band may seem like the usual college band program. We have a 350-person corps-style band fit with a full-sized pit and drumline, color guard, dance team, majorette line and a fire twirler to boot. But there is one major difference between us and the bands that sit across from us in the stadium on any given Saturday: we don’t have any music majors. Down in Atlanta, Georgia Tech’s claim to fame is its engineering and science programs. Our School of Music sits within the College of Architecture, the most “artsy” department on our campus. Our Marching Band is under the professional leadership of four band directors. Since we do not have any graduate assistants, our organization is almost entirely student-run. The Tech Band has four drum majors, a couple sections leaders per section, a few Band Club officers and 3-4 students working on various teams such as uniforms, properties, libraries, etc. And of course, we have the help of our local Epsilon Theta chapter of Tau Beta Sigma and Iota chapter of Kappa Kappa Psi. 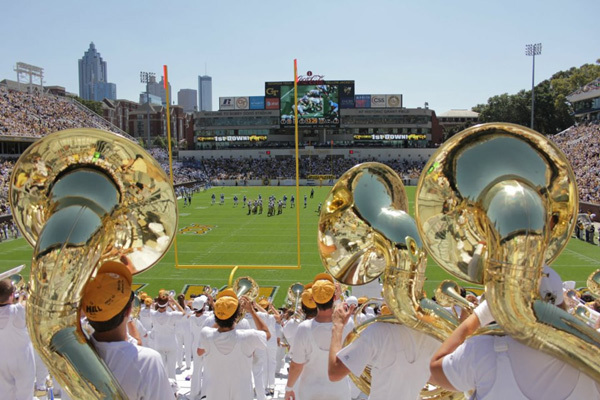 Our Greek organizations play a vital role in the success of the Band and School of Music. Iota and Epsilon Theta work closely to provide the Marching Band with anything they may need whether it be hosting a shoe-cleaning day before a performance, building a shelf to hold the new tuba bells, or purchasing water bottles for the visiting band on GAMEDAY (we never write that word in lowercase – one of our many quirky traditions). The Brothers and Sisters maintain a close relationship with the directors and are there to help the Marching Band with any and everything they may need. Since no one is enrolled in Marching Band to satisfy a core requirement or because they have to be there, some of the dynamics of Tech’s band are different from the usual college band. For instance, all students actually look forward to going to band practice every Monday, Wednesday Friday from 4-6. It is a guaranteed six hours a week where students don’t have to think about differential equations and thermodynamics, but on perfecting their sets and music. Students do not get paid or receive scholarships for participating, everyone is there because they just love it; they love music, they love the physical requirements, and of course, a two-hour GPA boost is always welcomed by GT students. “Georgia Tech’s music scene is incredibly unique because it allows musicians, marchers, and performers of all backgrounds to put their own spin on art. While maintaining a strong focus on research and technology, the average [Georgia Tech] musician brings a rare perspective to the field that pure musical training cannot necessarily bring alone”. We unofficially call ourselves the “$1.98 Noise of the Southland.” This stems from our very chill and laid-back approach. Like most bands, we still learn two halftime shows a year, a full pre-game show and travel, in at least some part, to every football game. We have a complete blast and don’t have to wake up at 5am on GAMEDAY for a rehearsal. What keeps students coming back every year is the unique traditions we have developed over the past 104 years, the social aspect, the pride we have for our Institution and of course, our love of making music. Brother Justin Brown came from a high school band of about 35 members. He saw the passion for music drift away and was then discouraged to join band in college. It was when he spoke with current members of the GT Band he decided to join his sophomore year and he never looked back. “I can say I am proud to be a Yellow Jacket, but I could never say that if I didn’t join the band,” Justin says.